According the National Association of Realtors– pending sales is the “forward indicator” of real estate sales and reflects how well the market is doing. Keeping Current Matters Realtors© and the public need track and understand the impact of pending sales when it comes time to list and sell your property. The chart below provides an insight into yearly pending sales during the month of July. The official numbers for August will be available later this month. 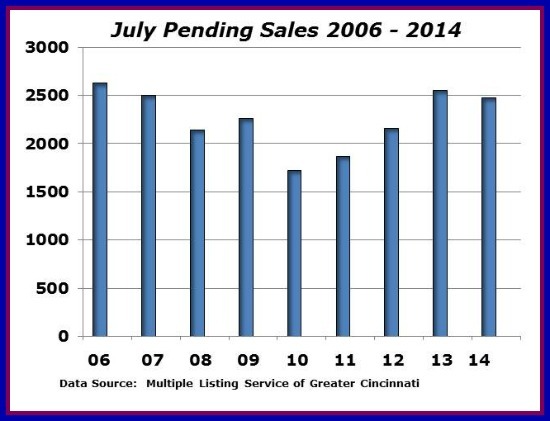 As you can see the pending sales for July, 2014 are slightly lower than the same time frame in 2013. The slight drop in pending sales is a sign to think long and hard before accepting a listing that is even “slightly” overpriced because chances of it sitting on the market and losing value in the eyes of buyers is very high. So when it’s time to list your property and your Realtor© sits down with you to discuss marketing and pricing you have to digest a lot of information as well as review the competitive market analysis which provides data for about the number of homes currently for sale, the number of pending sales and, finally, the information pertaining to actual sale price of sold properties. It’s easy for our eyes to gravitate toward numbers we want to see- high sale prices and shortest number of days on the market. Incorporating the number of pending sales into the mix aids in understanding whether the local Cincinnati real estate market is holding steady, gaining steam or…losing ground. 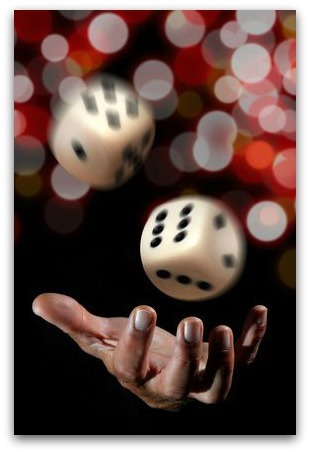 Knowing the trend is critical to pricing to capture the next batch of buyers looking in your neighborhood or complex.